← The Nicene Creed and the Invention of the Trinity? Today the Hollywood movie September Dawn opens in 1000 theaters nationwide. The dramatized portrayal of the Mountain Meadows Massacre–wherein Mormon men massacred 120 emigrants as they peacefully passed through southern Utah in 1857–is unwelcome among Latter-day Saints. The film has been called “controversial” by the news media, but has received stronger condemnation from Latter-day Saints. “According to Tom Kimball, a sixth-generation Mormon who is book review editor for the Mormon History Assn., the film has been put on a ‘do not watch’ list by LDS Church officials. Nevertheless, September Dawn will likely have its run in American movie theaters. If the film had been made in the 1920s, though, this may not have been the case. On August 24th 1921 LDS Church President Heber J. Grant wrote a letter to U.S. Senator and fellow Latter-day Saint Reed Smoot. President Grant expressed his deep concern–and that of the LDS First Presidency–over the nationwide distribution and showing of the motion picture “Riders of the Purple Sage,” based on a novel by Zane Grey. “I am also very glad to note that you have taken up the matter of preventing the motion picture houses from showing Zane Grey’s novel ‘Riders of the Purple Sage.’ Thru the efforts of the Commercial Club here and also others who have endeavored to have this stopped, I am informed that the picture is no longer passing censorship in the State of Michigan. I sincerely hope that it will not be necessary to bring suit in this matter. Yes sir. Much easier to malign an entire group of people based on the actions of a few people (well 150 years ago) than to have the guts to portray the current daily explosions of children with bomb backpacks. Hollywood knows no mormons will blow themselves into pizza toppings in nightclubs or discoteks after viewing this ‘film’. 84% of critics agree — September Dawn is just a crappy movie. I just returned from seeing the film. I’m thinking that those who make the sort of comments quoted above by Geoff may be people who have no background in LDS history. 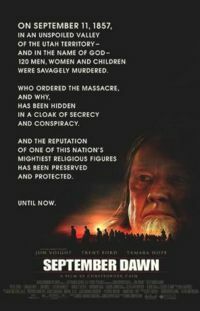 The religious statements included in the movie and attributed to LDS leaders are shocking (to say the least), and I’m certain they sound wholly unbelievable to the average viewer. This is not the Mormonism they see on television commercials. However, most of these shocking statements are things I have long known as the actual words of early LDS leaders. Understood from this perspective, the movie does not at all seem to be something trying to malign a religion; it’s merely telling it like it was. Of course, there are sappy parts, and use of artistic license, but overall, if one knows Mormon history, it’s clear the movie is not a slam-dunk hatchet job against the LDS Church. Personally, I found the movie to be moving and very sad. Perhaps calling it “entertainment” would be the wrong word to use. Watching a portrayal of the murders of 120 men, women and children should never be entertaining. But neither should it be forgotten. September Dawn is rated R for violence and gore. Nevertheless, I do recommend people see it. Hopefully, viewers will come to recognize the paramount importance of personal and spiritual discernment. The scathing reviews keep coming in. As of this hour, 90% of critics proclaimed this a pile of doo-doo. Portion removed. The MRM correlation committee does not approve of such insults. Regardless of who hates the movie or not, it still has some historical fact to it. What’s funny is I lived in Cedar City, UT and worked in St. George for almost 2 years and I NEVER heard of Mountain Meadows. And I went to our “ward” every sunday when we lived out there. It’s amazing how little people know of it, and when a movie comes out spreading information, some people call it “doo-doo”. My wife, me, and my father in law were watching TV and a preview came on of the movie. My wife said is that the massacre thing? That was supposed to be Brigham Young I guess. My father in law said Oh, I’m sure they will tell such an INCREDIBLE tale too… I just gave a little smile.. Regardless of what the movie shows, a group of Mormons slaughtered innocents. There is nothing good about that. I may be the first person responding here who has actually seen the movie, as it just came out yesterday. Frankly, I think that the reason this has received bad reviews is that it is a low budget film, and they seem to think that it shows. All of the reviews I’ve seen that have been negative have been commenting on technical and artistic issues in the film, not on its accuracy. They are written by industry insiders, who are much more interested in how the movie is made than the message it conveys. This film was incredibly moving. It was excellent in portraying the events that took place in this massacre, to the extent that I wanted to leap through the screen and strangle the characters who lied to foment others into committing atrocities against innocents. And those who committed the atrocities themselves. As to the accuracy of the film, it is my personal belief that it is quite accurate. I’ve done research on the subject, and this portrayal was in line with what I’ve learned. I’d recommend this movie to anyone and everyone. I think it has a great message that applies to all: if you choose to abdicate your duty to be responsible for your own action by allowing others to make decisions for you, you can very easily be led into evil. I wonder what percent of the Rotten Tomatoes “critics” have actually seen the movie. I suspect it’s somewhat less that 100. I don’t know if I’ll get a chance to see it. There are no showtimes here in northern Utah, and it wasn’t even reviewed by the local paper. Interesting. I guess it’s showing at one SLC theater, though. Those who have seen the movie will be encouraged to comment on it on Monday. Stay tuned!